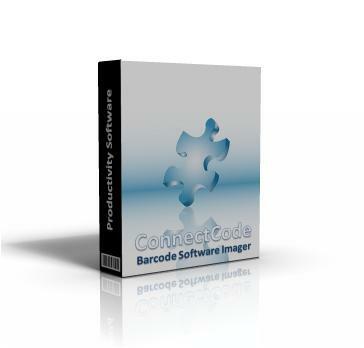 ConnectCode Barcode Software Imager supports the generation of professional high resolution barcode images that are highly scannable. It allows you to create different types of barcodes by entering your data and selecting the desired barcode. Why use ConnectCode Barcode Software Imager? 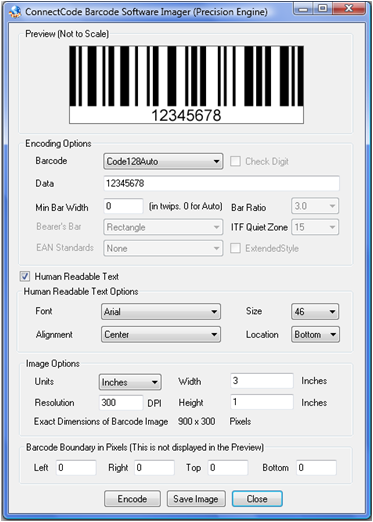 ConnectCode Barcode Software Imager utilizes our proven barcode engine. We have developed and marketed barcode software solutions for many years. Our barcode software is trusted and highly regarded by many fortune 500 companies. We have also helped many fortune 500 companies clear their institution audits and independent barcode verifications. These are vigorous tests and require both expertise and experience. As a result, out products are of high quality and stability. Most of our customers are very happy and satisfied with our products. With the trust built, these customers stay with us for many years. The Imager focuses in generating barcode images. This may appear trivial on the surface and there are a wide variety of products offered in the industry. Each product comes with a different price tag and offers different capabilities. The Barcode Software Imager leads the pack by being able to generate precise, high quality and professional barcode images that adhere to the strictest industry specifications. Getting the barcode image right as early as possible is crucial. The price to pay for a bad barcode can be very expensive in a downstream impact and may also affect your reputation. Think of how your customers and partners feel when the barcodes on your products cannot be scanned properly. The Precision Engine used internally by our Barcode Software Imager is our main differentiator between us and our competitors. The entire engine focuses on features and capabilities that affect the quality of the barcode image. For example, the engine allows you to specify the dimensions of the barcode image and boundary zone separately. This may seem unimportant to you right now. However our experience with independent audits tells us how important this is. Many industry specifications require the dimensions of the actual barcode to exclude the boundary for accuracy in scanning. The engine also allows the setting of the Thick to Thin Bar Width ratio, Quiet Zone, Minimum Bar Width in high resolution twip units, automatic calculation of the Minimum Bar Width, specification of Human Readable Text that is dependent on the Resolution of the Image. These are the capabilities that may not seem obvious initially but are used in generating high quality barcodes. Remember that your barcode will typically flow through the entire supply chain. A wide variety of scanners may be in used and thus you will want your barcode to be scannable by all these devices. Another subtle point you may ask after using our software is why we only support certain very specific values in some of the parameters. For example, only specific values are supported in the Bar Ratio. The reason is some of the values may work fine for your scanner but may fail when used with other types of scanners. This important knowledge is manifested by our experience in the industry and hence, in our products. Ever wonder why the scanning of certain barcodes in the supermarkets looks so difficult or takes so long? The most common reason is that the barcode has not been created properly. Hence it requires multiple scans or scanning at specific angle before it can be read properly. This defeats the whole purpose of improving productivity using barcodes. With our Precision Engine, we are confident that our Barcode Software Imager will be able to meet the strictest requirements of your business. Simplicity - Ease of use has always been an important consideration in ConnetCode. There is almost no learning curve and most users can start producing their barcodes right away with our software. The software automatically validates the Input Data and add any required Start/Stop/Check Digit Characters. We support all the necessary features and default many of the parameters to the most optimal values. The focus is to enable you create barcodes quickly and easily. Complete support of the various Industry Specifications - The software supports all the parameters required to configure the barcode as required by the industry specifications. Variable Barcode Sizes - You may choose to enter the width, height of the barcode in various units such as in Inches or Centimeters. The resolution of the image can also be set to accommodate various printers and software.